Cauliflower rocks! Why? Because it is packed with nutrients and life saving agents. 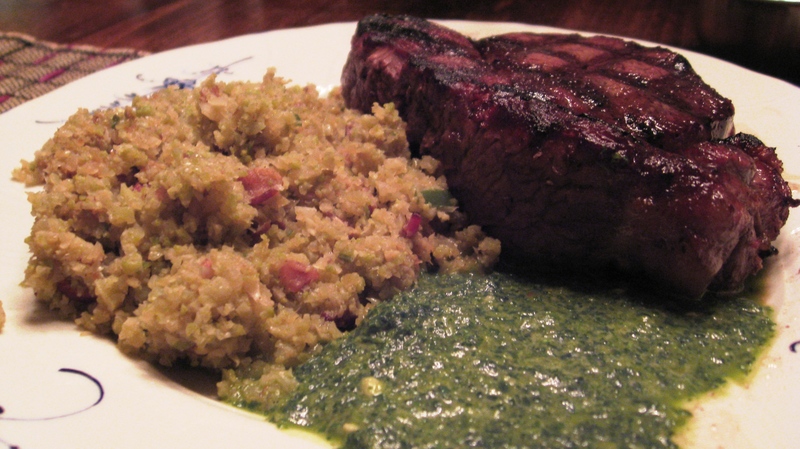 Today’s post is about our Green Cauliflower “Rice” with Bacon. Don’t fret, there is no added rice in this dish, as you will see the Cauliflower itself is cut to resemble the grain that has been happily removed from our diets. If you need a refresher on why rice, along with other grains, are NOT healthy, check out Mark Sisson’s “Definitive Guide to Grains“. 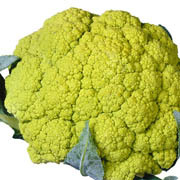 Next, take a look at the post over at World’s Healthiest Foods which details the health benefits, nutrition profile, history, and tips for enjoying Cauliflower. 2 Thick Strips of all natural pork bacon free of preservatives, nitrates, nitrites or antibiotics. In a cast iron pan cook the strips of bacon, remove the bacon, and chop them up into bits. Use the bacon fat to saute the onions, Serrano peppers, and garlic until golden brown. Add cauliflower rice to the saute and add bacon bits. Feel free to shove into the oven on 400 degrees for 10 minutes, but pan-fried is just as delicious! We enjoy this all the time, and have many variations to share. Sounds like a tasty alternative to steaming which is what we usually do with cauliflower. We both love bacon but, like you, we use it as an occasional seasoning. So this is another good reason to use bacon! As soon as I buy more cauliflower, I’ll give this a try.